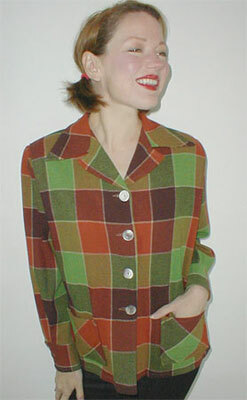 Recently I took stock of the vintage plaids I've come across for a photo set on Flickr, and realized that many of them were fine woolens from Pendleton. I live so very near the home of Pendleton (Portland) that I am determined to have a field trip to check out Pendleton history first hand. For now, here's a parade of Pendleton 49er jackets, the great sporty basic that Pendleton started making in 1949...the company's very first article of clothing for women. It has been made ever since, with some variations. The classic has flanged shoulders, a back yoke with gathers falling from the sides, roomy patch pockets with the plaid cut on the bias, big dark shell buttons, and long sleeves with buttoned cuffs. They are always plaid or tartan. A woman recently wrote me to say that her mother had sewn pockets in Pendleton 49ers until 1957. She was surprised to see a vintage jacket in purple and lime green plaid, asked her mother if that could possibly have been an original 49er color scheme, and her mother said yes! The variety was wonderful. Other companies made very similar jackets (I've seen Western Star, Spokane's The Crescent department store and the "Frisco Jac" by Minnesota Woolen Co. labels). and it really was a revelation to me that the jacket is shown belted in the ad, and Jody shows her favorite 49er belted. From now on I am all about the belt with this jacket! Here is an assortment of Pendleton 49ers (and a few 49er-style jackets by other makers) I've sold in the past, although the first is currently for sale here.